In The Post-Client Era, Did Tweetbot Just Swipe Twitter's iPhone Crown? Don’t focus on making new Twitter clients. The message has been very clear — well, moderately clear — for weeks now. If you’re a third-party looking to develop in the Twitter ecosystem, you should focus on data or niche experiences. Good thing Tweetbot didn’t listen. If you’ve looked at Twitter tonight, there’s a good chance you’ve seen the massive amount of buzz surrounding Tweetbot. It’s a new Twitter iPhone client made by Tapbots. And yes, it is very good. It’s so good that it has a number of people promising to walk away from Twitter’s own iPhone client. And that’s interesting for a few reasons. First of all, while apps like Echofon, Twitterrific, Seesmic, TweetDeck and other have their fans, Twitter for iPhone has been the undisputed king of Twitter iPhone clients since it was still known as Tweetie. In fact, that’s why Twitter bought it last year, along with developer Loren Brichter, and turned it into Twitter for iPhone (making it free in the process). Second, Tweetbot isn’t free — it’s $1.99. It apparently doesn’t matter, people are still insanely excited for this app. Third, Twitter is in the midst of a big push to get everyone using their own clients, and have been touting that shift taking place. Obviously, if Tweetbot actually does catch on, that could throw a wrench into things. The backstory of Tweetbot is equally as interesting. It was a year ago yesterday that Mark Jardine wrote a post on Tapbots blog exposing the Tweetbot project to the world. At the time, they had been at work on the app for nearly 3 months when something funny happened: Twitter bought Tweetie. This caused them to second guess not only the pricing of their app, but also continuing to develop the app itself. Will they [Twitter] eventually kill all 3rd party iPhone/iPad clients to prevent confusion between their app and all the rest? A year later, that’s sort of what Twitter would like to happen (though obviously they wouldn’t use the word “kill”). But recently, Twitter had a bit of a nightmare with regard to Twitter for iPhone when they decided to shove advertising — I mean the dickbar — I mean the quickbar into the app. It was ill-advised and didn’t last long. Still, it has planted a seed of doubt in many users head about the direction of the app. A year after it was first announced we have the app. Both Shawn Blanc and MacStories have very thorough reviews of just what makes it so good. I’ve only been using it this evening, but my initial impression is that I too might be willing to replace Twitter for iPhone with it. It’s simply very well designed and great for power users — particularly those who use Twitter Lists. I also love the idea of adding some chaos into the mix. If Twitter doesn’t own the most popular mobile client, what does that mean? Would they have to buy Tweetbot? Do they make moves to shut it down or limit it? What if Bill Gross tries to buy it? It’s enough to keep a blogger busy for weeks. The game has changed. 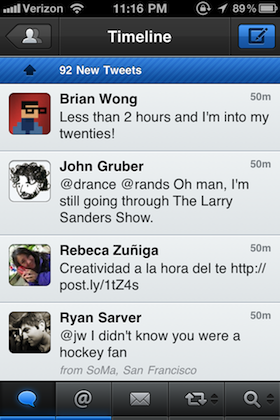 Try Tweetbot here — again, it’s $1.99, but worth it.